Updated 4/3/17: Anime Boston 2017 is done for this year. We would like to sincerely thank Anime Boston, the New England Anime Society, the Hynes Convention Center, Sheraton Hotel, Anime Boston Staff, all our members and all the attendees. Our celebration of Five Years of Service with Anime Boston has been our largest marketing campaign for a show partner to date. Without your continued support, our charitable mission would not be possible. We look forward to 2018 and beyond. In celebration of Five Years of Service with Anime Boston, we have gone retro! 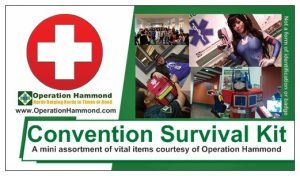 The members of Operation Hammond have been providing world class social medical services to the attendees and staff of Anime Boston since 2013. Anime Boston is New England’s largest and most celebrated Anime Convention. For the past five years, we have worked in cooperation with the staff of Anime Boston, Hynes Convention Center and the Sheraton Hotel to provide our services. We have helped countless people with social medical issues and first aid emergencies during Anime Boston day or night. Without Anime Boston we would not be the world-class social medical organization we are today. 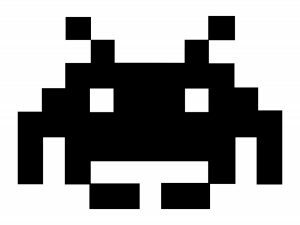 In honor of our commitment to service to Anime Boston, we have gone all out space invaders retro organization-wide! Be sure to follow us on Facebook, tumblr, and Twitter during Anime Boston for our latest updates, photos and more. We have a 24 hour First Aid station in the Sheraton Hotel, Liberty Ballroom C. Please don’t hesitate to come to us for help and any First Aid need. During Anime Boston our First Aid Station never closes. We welcome anyone at our First Aid station day or night no matter the situation. All of our services are discreet, private and confidential. 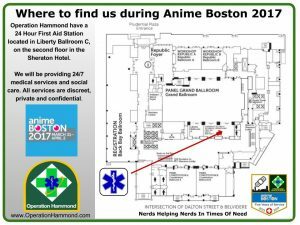 If you can’t make it to our first aid station find any Operation Hammond or Anime Boston Staff member for help. Check out our fan table near Hynes 108 in the convention center. There you can find out more info about our charitable mission and how you can help and volunteer. Be sure to stop by we will be giving away free swag and more. Operation Hammond members can be found by their distinctive white and green uniforms. If you need help or first aid please don’t hesitate to come to us for help. Be sure to stop by our fan table in Con Row near Hynes 108 to receive your free Convention Survival Kit. This mini kit has some vital items to keep next to your convention badge to help you get through the rigors of the convention. These kits were designed with direct feedback from convention attendees, cosplayers, and medical professionals to be simple, handy and useful. Be sure to stop by our fan table to get one and to learn more about our charitable mission. Keep in mind supplies are limited so be sure to come early. We would like to kindly remind everyone that Cosplay is NOT Consent. Just because a person or cosplay is dressed a certain way is NOT a reason for unwanted attention, pictures or harassment. Please give everyone their personal space and respect their right to say no to photos. 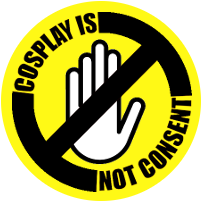 Please check out our Cosplay is NOT consent PSA section for more information and info-graphics. Be sure to check out our Convention Safety PSA section. During Anime Boston be sure to take care of yourself to stay happy and healthy. Be sure to follow our tips and tricks to stay healthy. After all, no one wants to catch the dreaded con sickness. Often times people that attend, anime, nerd, Pop culture, and Sci-fi Conventions forget to do one or all of the big four. Conventions and events are exciting places and full of people and fun things to do. It’s important that everyone remembers to take care of themselves. We would like to sincerely thank the Staff of Anime Boston, Anime Boston Volunteer Department, Hynes Convention Center and the New England Anime Society. 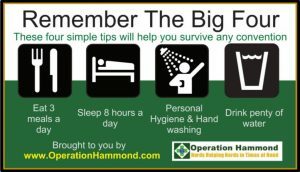 Without your dedication and hard work, the charitable mission of Operation Hammond would not be possible. If you would like to know more about our charitable mission and how you can help or volunteer please check out our About us section or Volunteer page.